Chief Electoral Officer of Chhattisgarh holds the responsibility for successful conduct of elections and release of voter list of state residents. CEO publishes and updates the Chhattisgarh Voter List with Photo (electoral roll) prior to every elections. Accordingly, people can make Voter ID Card Search by Name online at official website of CEO Chhattisgarh at ceochhattisgarh.nic.in or election.cg.nic.in in the CEO CG Voters List 2019. People can even download CG Voter ID Card as per the Chhattisgarh Voter List before casting their vote. Election Commission is going to conduct voting for Lok Sabha elections in the state on 11th April 2019, 18th April 2019 & 23rd April 2019. As the date of assembly elections is inching closer, CEO department regularly updates its database and has released the District-Wise Voter List Chhattisgarh. Moreover, people can also Download Voter ID Card by manually searching the complete list (PDF) at NIC (National Informatics Centre) election search website at election.cg.nic.in. People can use the online process to obtain their S.No. (Matdata Suchi Parchi) and voter card. Accordingly, people can click their District Name (Zila), Assembly Constituency (Vidhan Sabha) and then click “मतदान केंद्र की सूची देखे” tab. Finally candidates can perform Manual Voter ID Card CG Search By Name in the complete Chhattisgarh Voter List with Photo 2019. For CG Voter ID Download, all the candidates can find their name online at the official website of Chief Electoral officer (CEO) of Chhattisgarh. Finally after finding their name online, candidates can download the CG Voter ID Card and take a printout to caste their important vote. Then all the details of the candidates will get displayed on the screen. Finally, Download Voter ID Card Online for Chhattisgarh Elections 2019. This data is updated every week on a regular basis. Here candidates can enter their District, Area, Name and other details and then click the “Search Name in Electoral Roll” button to fetch complete details. Take a printout for the CG Voter ID Download. This method searches for the name of the candidate in the booths / matdaan kendras coming under the residence area of voter. 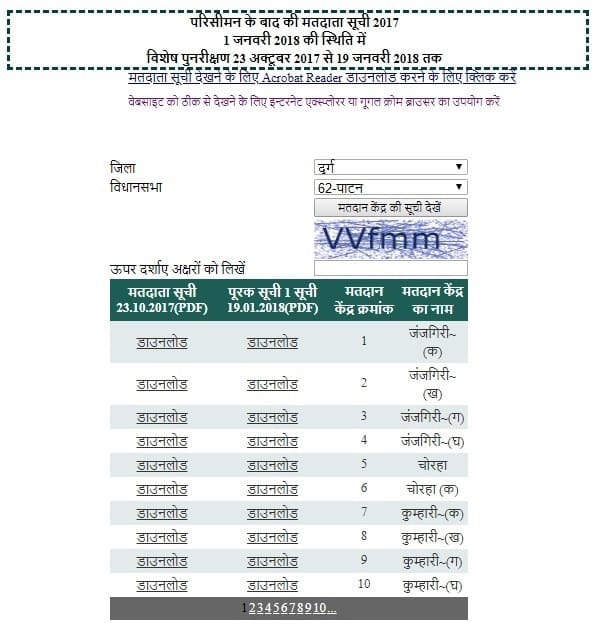 From all the above mentioned methods of CG Voter ID Download, candidates can easily find their name in the Chhattisgarh Voter List With Photo. Furthermore, all those people whose name does not appears in the Chhattisgarh Voter List does not have to worry. They can make online enrollment for CG Voter List 2019 and can then download their Voter ID Card.